Located northeast of Raleigh, Nash County was founded in 1777, named for Revolutionary War hero Francis Nash. The county seat is Nashville, though its biggest city is Rocky Mount, half of which lies in Edgecombe County. The economy is predominantly agricultural. In some respects Nash County can be considered the birthplace of the modern Republican Party in North Carolina. From Rocky Mount came Jim Gardner, a conservative businessman who founded Hardee’s and shocked the state political establishment when he won a seat in Congress in 1966, the first Republican to represent parts of eastern North Carolina in almost a century. Starting in 1980, Republicans at the presidential level carried Nash County, often by overwhelming margins. But around 2000, things started slowly changing as Nash became less white. John McCain barely carried Nash County in 2008, and in 2012 it was the only McCain county to switch to Obama, ending a 32-year GOP streak at the presidential level. What was the cause for such a shift? Put simply, the white population in Nash is in decline, while the black population, particularly in Rocky Mount, is exploding. The Hispanic population is also growing and now numbers 6% of the total population, but a far smaller percentage of the electorate. The successive Obama campaigns also brought about massive increases in black registration whereas previously many of these voters were unregistered. The coalitions in Nash are roughly even in presidential years. In non-presidential years, Republicans still have an advantage, though this is eroding quickly. Southern Nash County is white and strongly Republican. 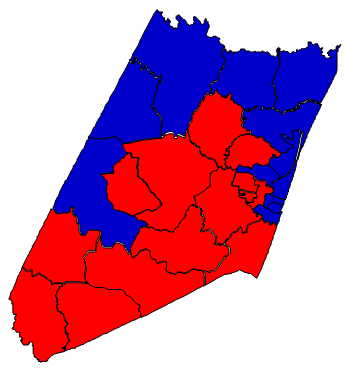 The northern and eastern parts of the county are more diverse and Democratic. Rocky Mount is heavily African American and almost entirely Democratic, and Obama’s improvements here in 2012 can be traced almost solely to increased turnout in the city. Forecast: In 1988, George H.W. Bush carried Nash County by nearly 30 points. Dukakis, a liberal, was wildly unpopular in this socially conservative, eastern North Carolina county. Bill Clinton four years later did a little better, being a better cultural fit for Nash voters. Though Clinton was a fellow Southerner, he faced a backlash over his anti-tobacco policies. Republicans now had a solid hold on the white vote, but demographic changes since 1996 has resulted in a consistent Democratic trend. Nash County is now rated R+3, a toss-up county. In a tied presidential election, Republicans are favored, though just barely. Nash is an inelastic county. There are few swing voters. In suburban areas of North Carolina, Republicans can improve by putting on a more moderate face, but it’s unclear if that will pay dividends in Nash County. Mitt Romney won 81% of the white vote here in 2012, meaning that there is not much room to improve. Republican hopes on winning Nash County in the future rely on a decrease in African American turnout. With Obama off the ballot in 2016, that’s highly probable. Even so, the underlying demographic trends highly favor Democrats, and the question for when Nash becomes a blue county is not if, but when. Voter registration numbers since last election continue to show more African Americans registering to vote in Nash County than whites, indicating that the demographic trends since last decade are continuing. The growth rate in the 2000s was 9.63%, below average. A decline in the total white population was combined with a 20% increase in the black population, contributing to a strong Democratic trend. A negative growth rate is projected for the 2020 census. Either the African American population is no longer growing. Alternatively, the white population is shrinking further. It is almost certain however that the black population is still growing at a higher rate than the white population. Further evidence of the Democratic trend in Nash County comes from the Senate elections of Richard Burr. In 2010, Burr walloped Secretary of State Elaine Marshall, but he did worse in Nash County against her than he did against Erskine Bowles six years earlier. Republicans face a bleak future here. Solidly Republican voters are being replaced by solidly Democratic voters. In a decade, a Republican victory in Nash County will probably be impossible.